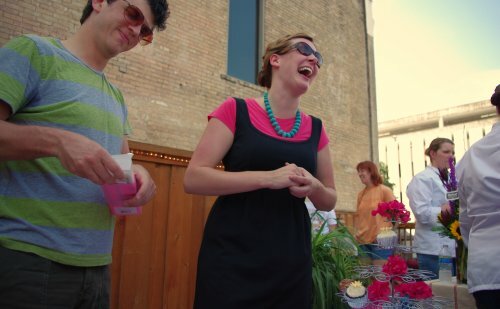 Thank you, Austin cupcake lovers! 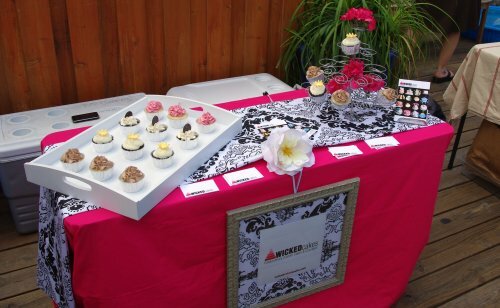 Thank you to everyone who stopped by and sampled cupcakes from Wicked Cakes at the Cupcake Smackdown last weekend… it was a true pleasure meeting everyone! We’ve had some great responses over the last week in the blogosphere… here are a few of the wonderful notes we’ve seen! The New Media Lab did a great article on how the event was promoted via Social Media/Networking, making it a huge success. 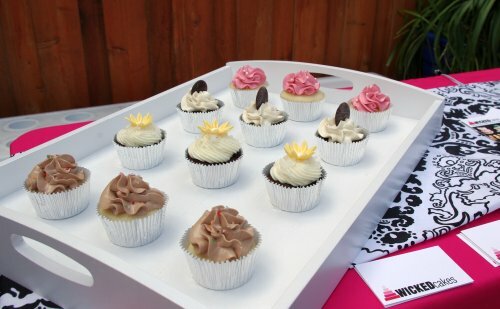 Wicked Cake’s cupcakes are featured in the photo reel at the top. Enjoy! Foodie is the New Forty was kind enough to include a sweet pic and comment about our chocolate cupcake with coconut cream cheese frosting and little yellow sugar daisy! Here are some additional places where Wicked Cakes showed up in some gorgeous photos… thanks, everyone! Wicked Cakes at Cupcake Smackdown 1.0! What a fantastic and wonderfully crazy day! The first ever Cupcake Smackdown was this past Saturday here in Austin, TX at the One-2-One bar downtown. Jennie Chen, from MisoHungryNow.com, organized a fantastic day for cupcake and dog-lovers alike. With more than 1000 attendees reported, more than 700 cupcakes, and loads of pups, the Smackdown was full of cupcake-loving energy. Wicked Cakes had the great opportunity to sell a variety of Wicked Cupcakes benefiting the Food & Wine Foundation of Texas. We had an absolute blast interacting with the crowd, selling delicious treats and hanging with new friends from Cupprimo, L’s Cupcake Cafe, The Cupcake Bar, Walton’s Fancy & Staple, and Hill Country Cupcakes. 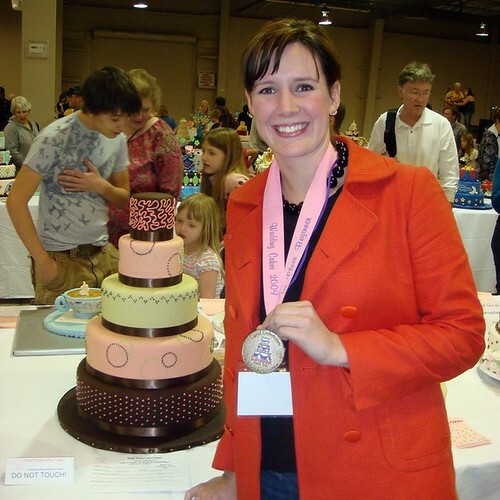 Wicked Cakes to Compete in 1st-Ever Cupcake Smackdown in Austin!! 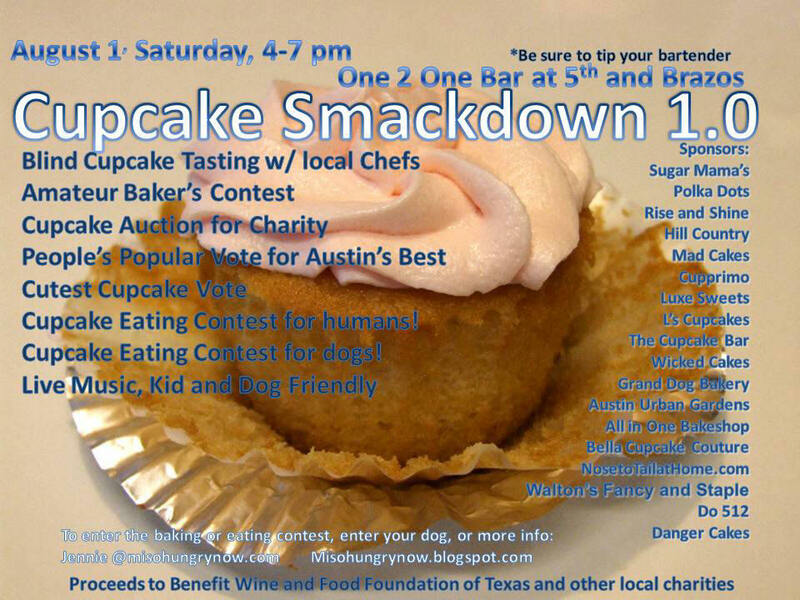 If you’ve got some time this Saturday afternoon, come out to the One-2-One Bar in Austin from 4-7pm to check out the first ever Cupcake Smackdown. With a blind tasting competition of all the local cupcake shops, cupcake eating contests, and support for local charities, it promises to be a great event! Wicked Cakes is sponsoring and competing in the event… if you have some time to come out and show your support (and east some yummy cupcakes! ), we would love to see you out there! Check out this link for all the details, and feel free to contact me directly with questions… Thanks so much! Just had to share this… My boyfriend’s son, Peyton, was so excited about my win last weekend that he asked to make a celebration cake for me. 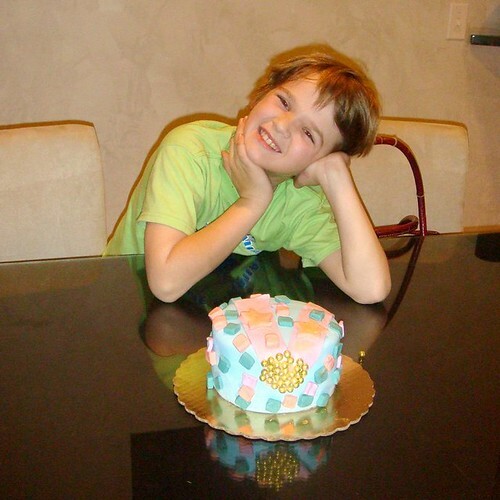 :) I baked a vanilla cake and covered it with blue fondant (at Peyton’s request), and then he decorated everything else himself. As you can see, it’s actually a gold medal in my honor… how sweet! Thanks, Peyton! The awards ceremony for this year’s competition was held today , and 1st, 2nd, and 3rd place medals were awarded in each divisional category. I had two cakes entered in the Adult Beginner Tiered Wedding Cake category, and to be honest, I wasn’t expecting anything. Given some of the beautiful cakes in my division, I figured this year would just be a learning experience. Imagine my surprise when I not only placed, but I actually took the gold medal in my division! It was a great validation of the hours of work put into the competition cakes. :) Woohoo! Next year, I’ll technically still be in the beginner category… already making plans! Wow! What an experience attending/competing in my first cake decorating competition this weekend. With easily a hundred (probably more) cakes competing from bakers ranging from child/teen to adult beginnering all the up to professional/master, there were some amazing cakes. 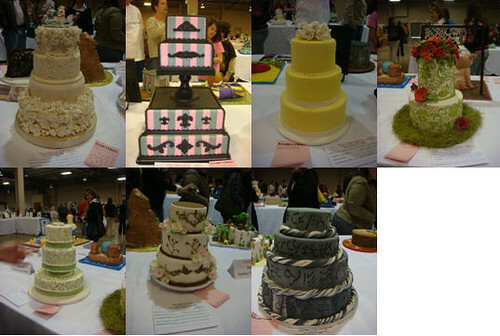 I entered two cakes this year - both Tiered Wedding Cakes in the Adult Beginner division. My group ended up having 9 total entries, which I’ve pictured below. I’ll write more when I find out who won! This weekend was dedicated to one of my entries for this year’s Capitol Confectioners Club show/competition (That Takes the Cake 2009). 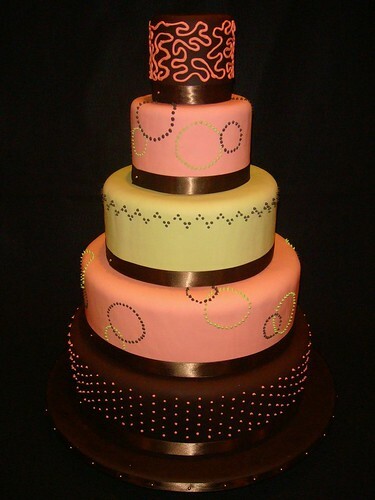 I decided several weeks ago to attempt a three-tier wedding style cake decorated in a tile-like mosaic. 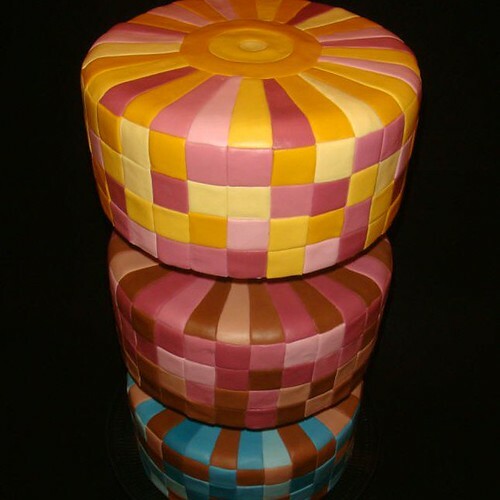 With 12 different colors of fondant, this was a big project and took most of the weekend. The “cake” is actually styrofoam since it’s for the show - an interesting new medium to work with. :) Now that this cake is ready to go, I’ve got 1 or 2 more that I need to rock out for this weekend!